Global expansion provides exciting opportunities for the company and the executive that is chosen to go out into the world and execute the global strategy. The vision and expectations are high, and the optimism is at its fullest. The costs of having an executive abroad are probably the single largest expenditure on any one individual in the company. 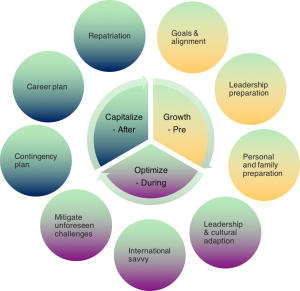 Since success rests highly on the executive’s shoulders securing and optimize performance is critical. Substantial monetary value and personal gains from working with a coach. Delays, local competition, different cultures, leadership challenges, limited network, complicated legal systems, family problems, lack of headquarter backup and unforeseen crises are not the exception, but the rule. Working with a coach can ease the process of overcoming these challenges and secure performance at any time. There are a substantial monetary value and personal gains from working with a coach. Get inspired by this short video with Bill Gates & Eric Schmidt. When expanding abroad it’s all about preventing value destruction and optimizing & enabling performance and growth in unknown territory! 25% who completed the assignment left their position for a competitor within one year. I have developed the Global Performance Model addressing and optimizing performance all the way through the global expansion. It is a self-liquidating investment!